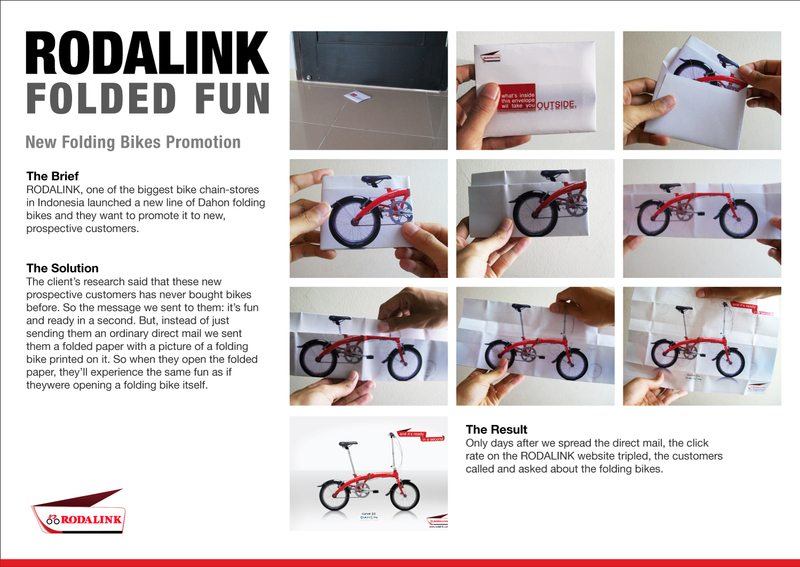 RODALINK, one of the biggest bike chain-stores in Indonesia launched a new line of Dahon folding bikes and they want to promote it to new, prospective customers. The cIient’s research said that these new prospective customers has never bought bikes before. So the message we sent to them: it’s fun and ready in a second. But, instead of just sending them an ordinary direct mail we sent them a folded paper with a picture of a folding bike printed on it. So when they open the folded paper, they’II experience the same fun as if theywere opening a folding bike itself. Publicado por Jaime Arias en 12:50 p. m.